I was delighted to join local residents and conservationists at a demonstration at Vale of Health pond today to call for the preservation of Hampstead Heath. 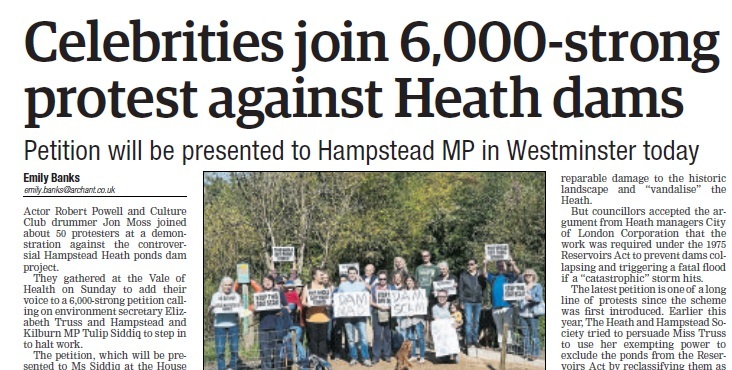 The demonstration, organised by Hampstead’s Village Voice, was on the first of the new dams to be completed on Hampstead Heath. However, with the dam in place, instead of a heath, the area’s been reduced to looking like a grass verge on a street pavement, complete with kerb stones. I was opposed to the Dam project in the first place, and will continue to call for the works to be done far more sympathetically: both for reduced construction disruption and for landscapes to be as changed and ‘parkified’ as little as possible. Sadly, Camden Council rammed through the planning approval, despite the opposition of thousands of local residents. Despite that, it’s important that the community remains vocally against it. Only by making a noise, even when battles seem lost, will we warn Camden Council against future unwanted developments that harm our Heath.